INVENTOR'S "SECRET" PLAN. From Our Own Correspondent. New York, Thursday. Millionaires, attention!" An advertisement under this title had an amazing sequel before the Grand Jury in New York. advertisement was inserted in a great Metropolitan daily newspaper by Mr. Max Baum, a landed proprietor and inventor, proclaimed that he could win the war one hundred thousand sterling ,000). He wrote to 400 millionaires g each contribute a thousand sterling- and upwards to a grand scheme for ending the war under the auspices of an American league for world peace ed victory." Mr. Baum received some unexpected re-es. One was from Mr. Roosevelt and other from Mr. Nathan Strauss, who both declared that they were too busy to interest themselves in the scheme. The most astonding reply came from the District Attorney in the form of a subpoena. Mr. Baum was most indignant, and wrote to the jury that he felt very ill. His foot was infected, and consequently he was unable to sit long, and he begged them to dispose of the ease as speedily as possible. The inventor appeared before the jury with an air of profound mystery, declaring that the whole scheme would be spoilt if he were forced to divulge any detail. The jury insisted on questioning the inventor, who asked that the doors should be tightly closed and armed guards stationed outside. This was done, and the inventor told the jury a wondrous tale, consisting merely of this, that if he could raise a hundred thousand sterling he would secretly build 50,000 aeroplanes and proceed to Washington to present them to Mr. Baker, to whom he would say: "Now, win the war." 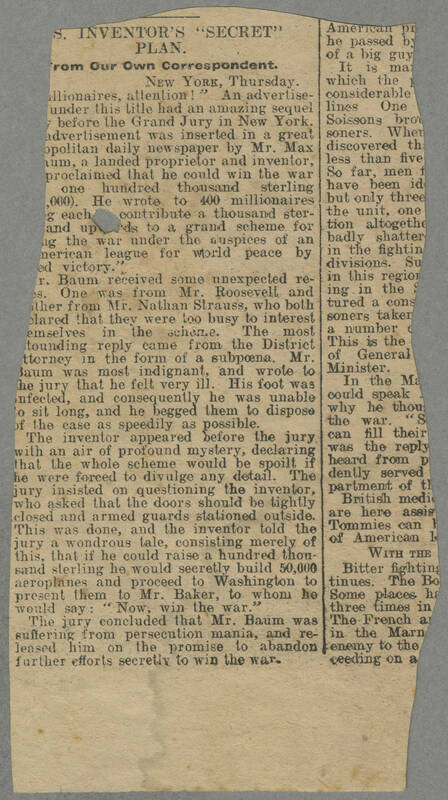 The jury concluded that Mr. Baum was suffering from persecution mania, and released him on the promise to abandon further efforts secretly to win the war.